Letter to human rights organizations in the USA and Spain soliciting assistance for American victims of domestic violence living abroad. I am contacting you regarding the lack of protection that victims of domestic violence in Spanish Judicial systems and the role that your association plays in the defending the rights of these victims. For the past 7 years I have been fighting to defending my rights and interests in Spanish tribunals, with no success. During these years, and on various occasions, the Asociaciones de Mujeres Divorciadas y Separados de Madrid (www.separadasydivorciadas.org), Federación de Mujeres Progresistas (www.fmujeresprogresistas.org), y Themis – Asociación de Mujeres Juristas (www.mujeresjuristasthemis.org) have confirmed the malpractice and negligence of my lawyers. Please find attached the decision of the Ilustre Colegio de Abogadosde Madrid (Bar Association of Madrid), the Preliminar 859/13 (posted on http://worldpulse.com/node/80671) where they contend that it is the right of lawyers in Spain to violate the rights of their clients under the principle of “judicial independence”. A contention that is absurd, and incredible that they would dare to include it in an official decision and in writing. The refusal of theColegio de Abogados de Madrid to investigate my allegations regarding said lawyers (with absurd rationalizations) are in violation of art. 10, 11, 404, 408, 412.3, 451, 510, 511, 512, 542, y 607bis of the Spanish penal code. Please find attached my appeal to this decision in which are enumerated the infraction of the implicated lawyers. 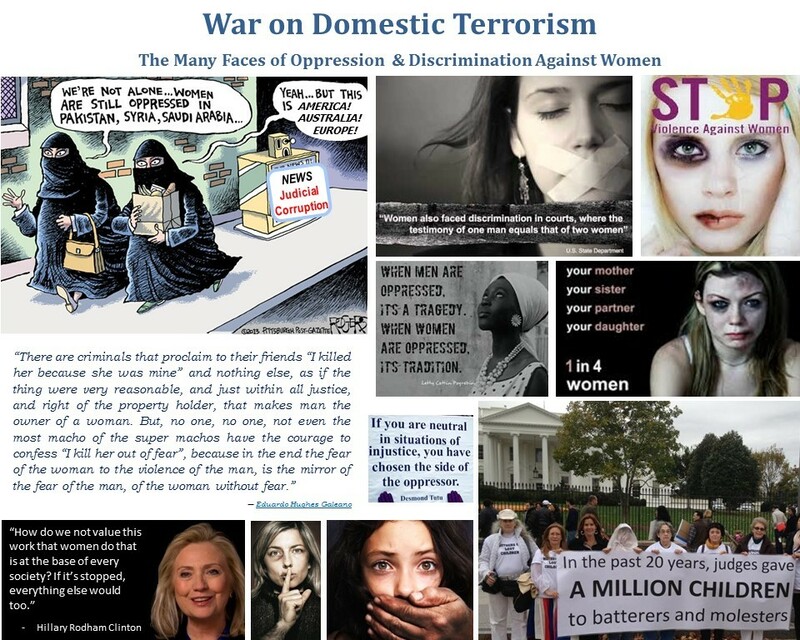 Noting that the global consequences, are 33.000 murdered women from domestic violence, and between 500 million and 1,5 billions children and up to 2.45 billion women that suffer from at least one form of violence in their communities and/or homes, with associated costs of trillion s of dollars. Please find attached the last edition of Family Courts in Crisis (FCC) that provides a resume of the reports by Amnesty International’s What Specialized Justice(in Spanish) and Save the Children’s Spanish Justice Confronted with Sexual Abuse within the Family (in Spanish) that exposes the problems in Spanish systems. (Please see FCC may ’13 – Feb. ’14 posted on http://worldpulse.com/node/71182 that examines the problems of ‘Western’ courts as well as an in depth examination of each aspect of the issues). While lawyers, judges, and psycho-social teams are in their ‘rights’ to violate the rights of victims and infringe laws (with systematic and extensive ‘impunity’, in full knowledge of the facts) by responsible authorities to investigate the facts, all of the laws (and public funding) in this world will not protect victims from domestic abuse. The importance and gravity of the problema can no longer be taken lightly, nor considered a ‘private matter’ and/or ‘civil dispute’ as lawyers, judges, psycho-social teams, Congressional and Parliamentary members, Consular and Embassy officials, Foreign Service officials…..The infractionscommitted by perpetrators of physical, sexual, and psychological violence, as well as accessories, notably judicial actors, that cover-up these infractions, are crimes under national as well as international law. And, therefore these crimes are elevated to ‘crimes against humanity’ under art. 607bis of Spanish penal code and Statutes of the Roma Statutes of the International Criminal Court. At present my case is in the hands of the Colegio de Abogados de Madrid before presenting it to the European Courts of Human Rights. Since Sept. 2013 I have not received any information from the Colegio de Abogados de Madrid. And therefore, I am requesting your assistance in finding out what is happening with my complaint, as well as assuring that they have sent my complaint to the Fiscalía for an examination of criminal infractions (as provided for under art. 2.1 y 2.2 del Decreto 245/2000 (and art. 451 of the Spanish penal code). Therefore, I hope that you, as an associations whose mission is to defend the rights of women, will officially request that the Colegio de Abogados de Madrid, la Fiscalía, the Defensor del Pueblo, and Consejo General del Poder Judicial (CGPJ) fulfill their obligation under Spanish law as well as international law to investigate my allegations against judicial actors. In consideration of my case and its merits, I wish to call attention to the fact that the violence and manipulations of my ex husband were the result of his efforts to prevent me from starting an Internet company (see attached Global Expat – Concept & Structure). And, my inability to create and develop the business in the past 7 years has been a direct consequence of the failure of my lawyers to reclaim common property and funds between 2007 and 2013. The business model that I was developing (local search directories and networking on the Internet – www.yelp.com – http://www.marketwatch.com/investing/stock/yelp/financials) are the most profitable models at present on the Internet. Therefore, the damages at present are around $500 million, increasing by 45% per year, with implicated lawyers (and accessories to their crimes) legally responsible for said damages. The failure of regulatory agencies (and therefore the Spanish government) to investigate, sancion and provide damages to me and my children, transfers the financial responsibility to the Spanish government under international law. Thanks you in advance for your time and consideration, and I remain at your disposition for any questions or clarifications you might need. I can be contacted through my email Quenby@global-xpats.com and my cel. 00.1.202-213-4911. Art. 607bis de Código penal –delitos de lesa humanidad quienes cometan los hechos previstos en el apartado siguiente como parte de un ataque generalizado o sistemático contra la población civil o contra una parte de ella. En todo caso, se considerará delito de lesa humanidad la comisión de tales hechos: 1º402 Por razón de pertenencia de la víctima a un grupo o colectivo perseguido por motivos políticos, raciales, nacionales, étnicos, culturales, religiosos, de género, discapacidad u otros motivos universalmente reconocidos como inaceptables con arreglo al derecho internacional. 2º En el contexto de un régimen institucionalizado de opresión y dominación sistemáticas de un grupo racial sobre uno o más grupos raciales y con la intención de mantener ese régimen. “crimen de lesa humanidad” –cualquiera de los actos siguientes cuando se cometa como parte de un ataque generalizado o sistemático contra una población civil y con conocimiento de dicho ataque: a) Asesinato; c) Esclavitud; d) Deportación o traslado forzoso de población; e) Encarcelación u otra privación grave de la libertad física en violación de normas fundamentales de derecho internacional; f) Tortura; g) Violación, esclavitud sexual, prostitución forzada, embarazo forzado, esterilización forzada o cualquier otra forma de violencia sexual de gravedad comparable; h) Persecución de un grupo o colectividad con identidad propia fundada en motivos políticos, raciales, nacionales, étnicos, culturales, religiosos, de género definido en el párrafo 3, u otros motivos universalmente reconocidos como inaceptables con arreglo al derecho internacional, en conexión con cualquier acto mencionado en el presente párrafo o con cualquier crimen de la competencia de la Corte; i) Desaparición forzada de personas; j) El crimen de apartheid; k) Otros actos inhumanos de carácter similar que causen intencionalmente grandes sufrimientos o atenten gravemente contra la integridad física o la salud mental o física.